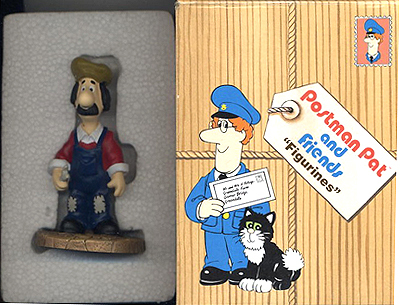 The ceramic figurines series ‘Posman Pat and Friends Figurines’ were licensed by Woodland Animations from 1999, though you can occasionally still find them for sale today. They depict characters from the original Postman Pat series by Woodland Animations. In this series you can find Pat (with mailbag and letter) and Jess the Cat, Ted Glen (flat cap and overalls), and several other characters including Sam Waldron (with hat and shopkeeper’s apron), Granny Dryden (glasses and walking stick). In November 2001 Woodland Animations was sold by Ivor Wood to Entertainment Rights. Subsequent Postman Pat toys and merchandise are licensed by ER plc.